Gareth Renowden at Hot Topic and others on the Left were deeply skeptical about suggestions in Air Con that "climate change" is being used as a stalking horse to heavily beef up the powers and funding of the United Nations into a defacto world government. "Conspiracy theory", they parroted as one. Well, as I have pointed out previously there was nothing "theory" about it - the book lays out the UN's own documents chapter and verse that detail some of the planning for a "new world order" (its own words), including plans for international taxes imposed under the necessity of combating climate change. "Some of the initiatives that have been proposed encompass 'solidarity levies' or, more generally, taxation for global objectives. Some countries have already decreed solidarity levies on airline tickets but there is a larger set of proposals. There have also been suggestions to auction global natural resources-such as ocean fishing rights and pollution emission permits-for global environmental programs. "The suggestion of taxes that could be earmarked for global objectives has a long history. To avert their being perceived as encroachments on participating countries' fiscal sovereignty, it has been agreed that these taxes should be nationally imposed, but internationally coordinated." Which, as Accuracy in Media's Cliff Kincaid notes, is simply code for the United Nations taking over ultimate control of these new taxes, but allowing the public to think they are national in origin, rather than world governance-related. I'd ask Hot Topic's Trufflehunter to explain his claim that the UN is not gearing up to become a de-facto world government on the back of climate change, but unfortunately Gareth has told his commenters that the subject is officially "off topic". Meanwhile, it seems the Arctic is not melting as much this year. While the NSIDC data has shown increased melt, it's also true that the satellite supplying NSIDC is becoming increasingly unreliable. Adding to the gloomy picture for the Chicken Littles over at Hot Topic is the fact that temperatures across the Arctic are still below zero one month into the northern summer - which is unusual and indicative that ice will melt slower while freezing air temperatures persist. One station is reporting the coldest June in 150 years. By way of an advisory to international customers, the book Air Con: The Seriously Inconvenient Truth About Global Warming by Ian Wishart will be available from regular bookshops in Britain, Europe and the US/Canada from the end of next week (June 26). If the bookstore is not holding stock they will be able to obtain it within 24 to 48 hours from Ingram Distribution, simply provide the store with the title, author, imprint (Howling At The Moon Publishing Ltd) and ISBN number (9780 958240147). The books are not being supplied from New Zealand and hence there will be no long waiting times - they are being printed locally in the US and UK. Will someone tell the Arctic it is supposed to be melting now? With temperatures in the Arctic remaining cool, it looks as though the ice is continuing to recover from its 2007 lows. 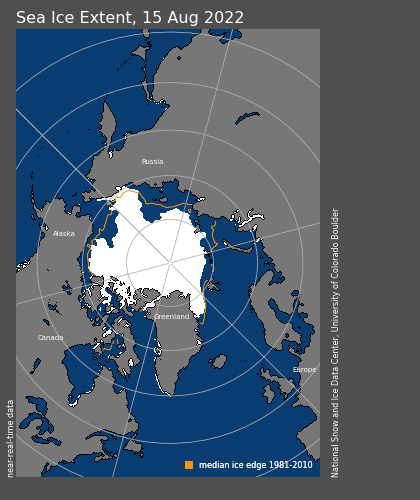 This one will get up Trufflehunter's nose and his repeated claims of "faster melt than ever", but so be it: the latest snow and ice official data shows Arctic sea ice extent for much of April and May has actually exceeded the average, contrary to what alarmists like the Hot Topic bloggers have been braying. The dark red line measures the actual ice extent against the average (black), whilst the light pink line reflects where faulty sensors had been underestimating Arctic sea ice extent until the fault was discovered. The purple line is 2007 and the blue is 2008. There isn’t any indication that the ice is “breaking up” in an unusual fashion. Temperatures in the Arctic have been running below normal. Hudson Bay is still almost completely frozen over. I’m sure the Polar Bears are just fine. A shipper would have to be a complete idiot to try to get through the ice, which is ranging from 1.5 metres to 5 metres thick. A new survey of various modes of transport has found a jumbo jet has less environmental impact per mile than an electric commuter train. One of the most inefficient modes of transport is an off-peak bus. The great public transport myth is only great if the service is packed and it offers no off peak services at all. Which, of course, defeats the purpose of public transport. Once you add in all the inefficient off-peak runs during the day and evening, the net pollution footprint of public transport far exceeds using the family SUV when you need to. “It is with deep regret that I have resigned my role as a Minister. “I am resigning from the role for personal reasons. “I tendered my resignation to the Prime Minister last night and he accepted. “It has been a privilege to have been a Minister in this Government. “I will not be making any further comment to the media.